Photo courtesy of Los Angeles Times. Terror struck Americans once again on Feb. 14. A 19-year-old former student of Stoneman Douglas Majority High School, killed 17 people and injured 14 more with his AR-15 rifle. There have been 18 school shootings in 2018 alone, a staggering number that shows the cracks in our gun safety. After the shooting, outrage poured in. Many asked how our politicians and intelligence services can be so incompetent, with a report showing that the Federal Bureau of Investigation refused to act on multiple tips that the shooter, Nicolas Cruz, was a dangerous individual who was armed and prone to commit a shooting. Americans also asked how their politicians couldn’t even find a way to ban bump stocks, as shown by the fact that 82 percent of Americans support banning bump stocks. 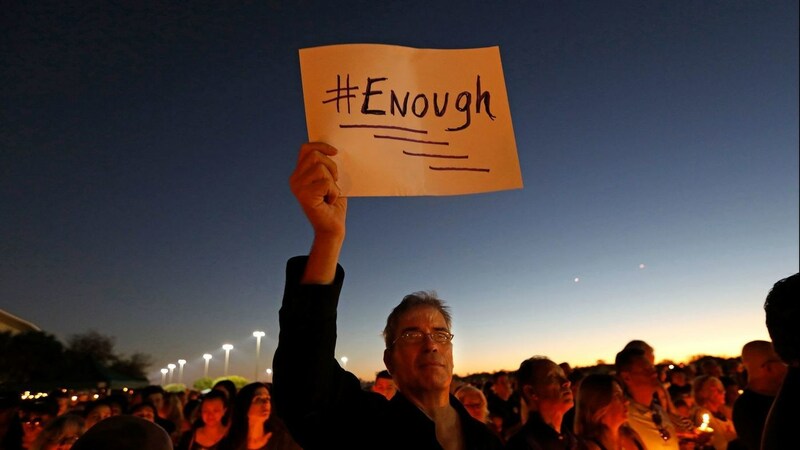 Many offered ideas on how to prevent such tragedies from happening again, with some even proposing that we remove the Second Amendment from the Constitution. However, such extreme measures are not needed to address this issue, which is why I believe that we need three steps in order to stop mass shootings in this country. First, we should ban the right for a person to own an AR-15. There is no reason for an American to own a 30-round rifle that is meant to be for military personnel, which is why it was banned from 1994-2004. An AR-15 has been used in almost all of these mass shootings over the recent years. Our Second Amendment is one to be cherished and not abolished, with the amendment’s main goal being that armed citizens shouldn’t only protect themselves, but also be able to protect themselves against government tyranny. However, there are extremes to every situation, and having a weapon like an AR-15 is one of those extremes. It is understandable to have a hunting rifle for sport or a handgun for home defense, but having a military style rifle doesn’t make sense. Hopefully, the government can create a transfer program of sorts, with people being able to get money from their turned-in AR-15 rifles. The second step is to fix our intelligence services in responding to threats like this. The FBI was tipped numerous times about this shooter and failed to act on the tip. That failure cost the lives of 17 people, an unacceptable result. Americans have to know that when they give a tip, it will actually be listened to and not tossed aside. A way to fix this problem is to remove the vast FBI bureaucracy, which is hindering the honest FBI agents from doing their important work. The third step is to improve mental health system in this country. Nearly all of these shooters had something mentally wrong with them and showed signs of such trouble, in which the guardian or friend didn’t act or didn’t have the money to send his or her child to a mental health rehabilitation facility. When a student like Nicolas Cruz gets expelled from school, they should be counseled to understand that their life truly isn’t over because they got kicked out of school or if they had family problems. Counseling programs can help bring some of these kids back on the right track and back on the roadmap of success. This issue should not be a Democrat or Republican issue, it is an American issue. The murder of innocent people, especially schoolchildren, is unacceptable in any society. Hopefully, America’s politicians will finally act on this issue in order to protect innocent Americans wherever they are, whether it be in a kindergarten classroom or a concert. Ain’t I a woman? Ain’t I strong? excellent points made by an intelligent young man. Why are our leaders hybernating ? When will they wake up and do something to solve these horrific murders, All are guilty !!! FBI CAN GET HOLD OF ALL RECORDS OF WEAPONS SOLD FROM THE MERCHANTS, OVER THE PAST 20 YEARS OR MORE, IN ALL THE STATES, THEN TRACE THEM, AND YES MUST HIRE MORE WORKERS, DETECTIVES, ETC. TO DO THIS TREMENDOUS JOB, ISN’T IT WORTH THE LIVES OF INNOCENT PEOPLE? SHAKESPEAR WROTE, “TO BE OR NOT TOBE THAT IS THE QUESTION ? AY, THERE’S THE RUB !!! You make excellent points here. I whole-heartedly agree with addressing the people’s declining mental health. In our entire school of 2,000 students, there isn’t one psychologist to help our general population. We do, however, have one psychologist who is on our campus part-time to serve our special education population and the majority of her time is spent writing reports and sitting in IEP meetings. Very little time is dedicated to counseling and treating our students. Fourth step: Let’s stop saying and printing the names of these shooters. How about if the media refrains from posting photos of these people? Let’s not make them famous for their crimes.